I can’t even tell you how stinkin’ good this soup is!! It’s super hearty with fabulous flavor and everyone goes for seconds. The best part of all is that if you have an Instant Pot, this pretty much makes itself with minimal effort from you. If you don’t know what an Instant Pot is, look it up. They are super time efficient electric pressure cookers and seriously make my life a lot easier. You can cook up white beans in 6 minutes, chickpeas in 12 (instead of simmering them for up to 2 hours! ), soup in minutes. You can saute in it, use it as a rice cooker (it’s stainless steel. No BPA or Teflon! ), a slow cooker, a pressure cooker and even effortlessly make your own yoghurt as well. There are many, many Instant Pot Facebook groups and I am obviously a huge fan. They clean up easily and mine lives on my countertop because I use it all the time. So back to the soup…This soup freezes really well and I love having this on hand to pull out of the freezer when you or your loved ones have the sniffles or when you just don’t feel like cooking! Press the saute button on your instant pot and saute your onion in 2 tbsp of oil (or a little water or broth) for about a minute. Add your carrots and saute for another minute. Add bay leaves, thyme, broth, red and brown lentils, potato and stir. Lock the lid in place and push the soup button and set for 6 minutes. Let the pressure release naturally. Remove the lid, remove bay leaves, add 1 tsp of salt, pepper to taste, 1 1/2 cups of corn, stir and serve. It’s that easy! Adapted from Nussinow, Jill. ‘Shane’s Fabulous Lentil Soup’. The New Fast Food . Disclaimer: We use Amazon affiliate links ONLY for products that I personally use and rely on. When you purchase something (anything!) through an Amazon affiliate link (or by clicking on the Amazon link in the sidebar) I receive a small commission at no extra cost to you. Thank you for supporting WHAT the HECK do I eat NOW and helping me continue to bring great content to this site! An absolutely delicious, super healthy, comfort food. Adapted From: Nussinow, Jill. "Shane's Fabulous Lentil Soup". The New Fast Food. Add your carrots and saute for another minute. Add bay leaves, thyme, broth, red and brown lentils, potato and stir. Lock the lid in place and push the soup button and set for 6 minutes. Let the pressure release naturally. Remove the lid and remove bay leaves. Add 1 tsp of salt, pepper to taste, and 1½ cups of corn. next time ill add another potato and carrot too. I made this today and it turned out delicious! I didn’t have red lentils so I used two cups of brown, added an extra cup of water (I also didn’t have broth so I added a few so spoonfuls of Better than Bouillon), and used canned corn at the end. 6 minutes was the perfect amount of time. Just tried this today for the first time. It is delicious, but I didn’t have nearly enough liquid. Did I read that right? 2 cups lentils to 6 cups broth? I had to put 8 cups broth in and it’s still like a stew…but a DELICIOUS stew! Not really complaining, just surprised. Hmm I tried this one out last night and everything came out obliterated. Super overcooked. The potatoes, carrots, and lentils were all turned to mush. Oh Brant I’m sorry and somewhat surprised. I make this soup very often exactly as the instructions are written as do many, many others and the results are always perfect. Are you using an Instant Pot or another kind of pressure cooker? Perhaps reduce the time and try again. I’m not sure why you’re getting different results. Yeah I was surprised since so many other people seem to have had such success! I’m not sure what went wrong. I am using and Instant Pot. I’ll play around with the time and see what I discover! Okay, this looks fantastic and I’m planning to make it tonight! So, that said – how would this work to use split red along with whole green? I’m assuming it should turn out okay other than the red lentils just mushing up? I’m second guessing getting the split red instead of the whole, but I can’t go back in time now! Here’s hoping! And thanks in advance! I’m in western Canada as well and you should be able to find both of these lentils at every grocery store (Are you near a Save On Foods?) Buy the red lentils they have (I have only seen one option available). As for ‘brown’lentils it is debatable whether or not they are brown or green but I think that they are referred to as ‘brown’ to differentiate from the smaller French green puy lentils. They are usually just referred to as ‘lentils’ with no further naming of specific variety. These lentils work together brilliantly as the brown/green lentils retain their shape while the red lentils disintegrate and thicken the soup. Good luck! Hi, I just found your recipe looking for a good way to make soup with the ingredients I have here. It sounds delicious! I’ve got brown lentils, pearl barley and yellow split peas — any idea whether these can be combined to make a variation of your soup in an Instant Pot? The packages of the lentils and split peas both suggest a cooking time of an hour; the barley soup instructions say to cook for 30 mins then add to soup. Thanks! I would use the brown lentils and yellow split peas as their cooking time is similar. The barley however will take longer to cook so I would agree with the instructions on your barley package stating to precook it and add it to the soup afterwards. Hope that helps! I pre-soaked hulled barley, increased the liquid and cooked for 15 minutes with quick release. Came out just fine. (I didn’t have potatoes or corn – also added chopped celery). We got snowed in yesterday down here in North Carolina and this was the first recipe I ever made in my Instant Pot. Boy was it simple and delicious! I used a medium red skinned potato and an additional teaspoon of Cow Camp Garlic season-all (basically a mix of garlic powder, onion powder, and some other seasonings). Once I dished it out into a bowl, I added some pepper, a crack of Himalayan sea salt, and a couple shakes of Valentina hot sauce for some extra flavor and some heat. We also made some homemade crunchy bread to dip in it! This soup makes AMAZING leftovers, by the way. Thanks so much for sharing! We are definitely making this a regular meal! Made this tonight, one of the best soups I’ve ever had! I used peas instead of corn but it worked out great! Thanks for the recipe! This soup is amazing. I’ve made it a bunch of times and passed it on to all my friends. I use a sweet potato and parsnip instead of the regular potato and it has an awesome sweetness. Made this today and it was tasty as advertised. The results were more like a thick stew. All the lentils broke down. This didn’t lessen my enjoyment was expecting it soupier, however. Should I : a) Vent more quickly? b) Add more liquid? I also used green lentils because didn’t have brown. Is this part of the reason? Made this soup today! It is yummy, but wow that’s a lot of lentils for four servings. A 1/2 cup of dried lentils per person? I haven’t divvied up the remaining portion, but hopefully it actually serves more than four people? My nutritional calculator comes up with 450 calories per bowl! If you want to double this recipe do you have to adjust the liquid ratio and/or cooking time? New to the Insta Pot thing! I set the cook time for 8 minutes, then released the pressure by turning the valve, then letting it sit for another couple minutes. Everything was cooked and it was faster than natural release. Currently sick with a bad cold/ear infection and want to make this soup! I only have Trader Joe’s steamed lentils on hand. I’m thinking maybe just add them once the soup is done and vented. Hmm, now I’m thinking maybe just make it on the stove top (even though I adore my IP!). Thanks! Also…when a recipe calls for “thyme” I get confused as to whether I can used ground thyme. I get nervous it’s too concentrated. But I just assume thyme leaves would be clarified. Is “dried thyme” the same as ground? Let me start by saying I am a diehard Lentil hater (mom made me eat them as a kid lol). I’ve been trying to change my diet for the better and came across this recipe. Extremely doubtful I tried it… Let me just say that it was amazing! I mean it was such a simple recipe and it was delicious. Wish mom would a made them like this lol. Will definitely make it again and again. I’m still fairly new to the instapot so I cooked them for 10 minutes, it’s a little too long, next time will go with the 6 minutes :). thank you for such a great and simple recipe. So wonderful just as it is, but since I live for curry, I added a tablespoon of curry powder and it made it even better, if that’s possible. And for anyone counting Weight Watcher points- it’s just 3 for a cup! Not bad for a filling comfort food. I made this for a friend recovering from dental surgery and she loved it. Then I made it for my mom and she loved it. Then it turned out she had signed up to feed 25 people visiting from Africa, so I doubled the recipe for them! Thanks so much. I can’t wait to try out your other recipes. Yes any potatoes will work! Has anyone made this recipe using yams or sweet potatoes in place of the russet potatoes? Wondering if they would come out to mushy. Thanks in advance! This sounds amazing. I have used both a red potato and a sweet potato with scrumptious success. Hi! I made this soup the other day and it was a hit! Can you tell me what kind of potato would be the best for this recipe? I’d appreciate it! Thanks for doing what you do! I love my instant pot. I wish I had a huge bowl of this soup right now since I am currently under the weather thanks to kids back in school LOL. I will definitely be making this. One batch for dinner, and make a 2nd batch to freeze for days like this. Even though I am not vegetarian or vegan, I still enjoy meatless dishes to save money. Not just that, but this soup is just so darn healthy. Can’t wait! Ok so I came across this recipe on pinterest while looking for a vegan lentil recipe. 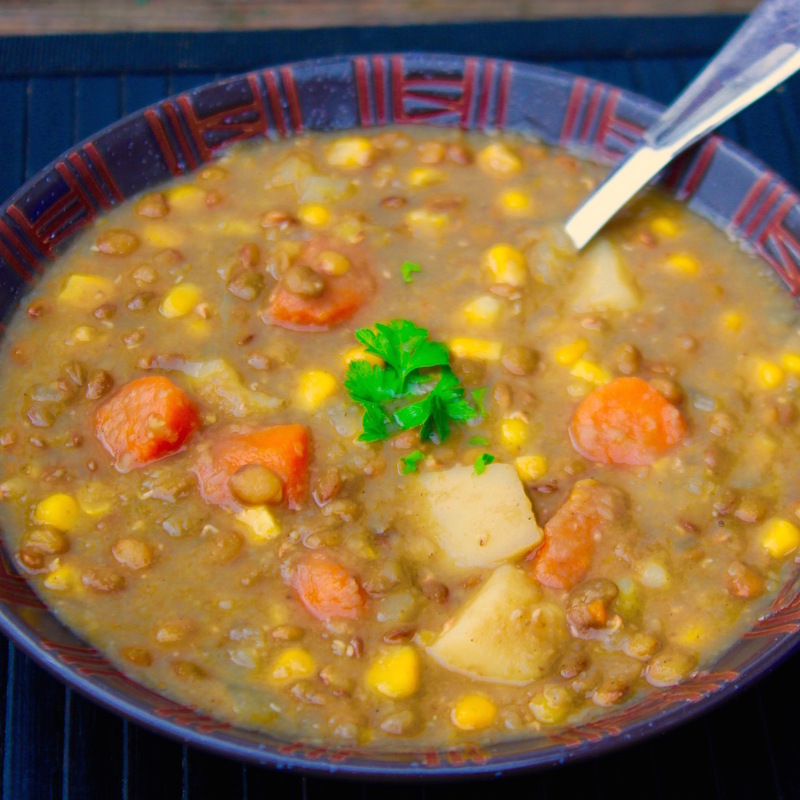 I read the reviews and I was thinking, “what can be so special about lentil soup.” WOW!!! Now I know! It’s such a simple recipe list but it comes together to create such a delicious soup. Thanks so much for sharing. I’ll be making the pot pie later this week and I can’t wait to try it. Been a vegan for just a little time and I was certainly coming across some “what the heck do I eat now” days. So glad I found your site. We made this tonight and the entire family loved it. It was the first time our 13 month old actually gobbled anything that had lentils in it! Thanks! I liked the consistency of the soup (kind of like pea soup) and think the ingredients are great, but mine turned out pretty bland. I added a tablespoon or so of Bragg Liquid Aminos to accentuate the flavor. Hi Kara! Yes, the natural release can take awhile. I made this soup tonight and manually released it 23 minutes after it was done cooking. It took less than a minute for the pressure to fully release. Red lentils do disintegrate with cooking and because of this quality are often used to thicken a sauce/soup. The green/brown lentils hold their shape much better. I do not find that the remaining veggies are soggy but the added corn after cooking does add a nice ‘crunch’ to the finished product. If your soup is turning out mushy I would try manually releasing it earlier and that should help. Also I have to wonder if you are cutting your veggies too small and they are therefore overcooking? Really simple, and my GF could not get enough of it. 🙂 Thank you very much! Absolutely lush, and so easy to make. Just got my new Instant Pot yesterday and I had favourited this page knowing it would be one of the first things I’d make with it. As it turns out, this delicious soup is its christening! Thanks for recipe. I made this yesterday and it was delicious; a hearty dish perfect for the winter. Tasted even better today as the flavors deepened and it is a perfect recipe for me as I try to embrace a Whole Foods, Plant Based way of eating. In my serving today, I stirred in a teaspoon of asian chili sauce which gave it a nice kick. I do have an instant pot question though since now I am inspired to make red lentil/red pepper hummus. The Instant Pot website says the dry red lentil cooking time is 15-18 minutes so why when I prepared your soup, it was able to only cook (fine) in 6 minutes punched into the pot? Not sure if you might have an answer on this. Does the cooking time increase if you double/triple the recipe? Is the 6 minutes for presoaked lentils or dry out of the bag? I just made it tonight with black lentils as I couldn’t find brown ones. It was great and even my husband loved it. I noticed u said 2tbs of oil (or a little water or broth) does it become soup with just oil? Sounds delicious and I want to try this recipe tonight. I just don’t want to mess up. It also has 6 cups of vegetable broth:) Some people don’t like to incorporate oil into their diet. For those who don’t they can saute their veggies in a little water or broth instead of oil. Regardless of which method you choose you will still need to add the 6 cups of liquid broth. only 6 minutes? I can’t wait to try this! I thought it would take much longer. Can I use green lentils instead? Yes! If you are talking about French green lentils I would add a couple of minutes to the cook time as they generally take a bit longer to cook than brown lentils. I have fresh corn from the farm, I’m thinking of cutting off the kernels but they won’t be frozen…do you think it will still work ok? Can I use a dutch oven or a slow cooker? I don’t really have the time for a slow cooker tonight. You can make it on the stovetop. I would follow the same directions but saute the veggies in a pot on the stove. The lentils will take about 30 minutes to cook and you’ll need to stir it once in awhile. I hope that helps:) It will be just as good! Do you add the corn frozen? thanks! This has become a staple in our household. My husband loves the smell of the onion, carrot, thyme and bay leaves sauteeing. My daughter eats it up. How many cups of water is needed to make it in the instant pot? How would you make it without the Instant Pot? I love this! 1/2 way through making it I realized I had only a few red lentils so I subbed them for quinoa, one cup of that and one cup brown lentils and it was amazing! My 2 year old son and I had 3 bowls each! I have 1lb of semolina small vegetable shells and a bag of red lentils. I would like to make soup in the instapot. Can someone give me the minutes to cook this. Thank you in advance. Made this soup today and not only the aroma smelled good but the taste was even better. You should all give it a try. I know you’ll love it. I sure did!! I love my instant pot and mine also lives on my counter! It is my very favorite kitchen toy!!!! And I am going to be using it for this recipe as soon as I have finished this comment. This soup is exactly what I am feeling like having today!! Thank you again Tara for never letting me down. Your recipes are amazing and I haven’t as yet tried one which I didn’t love!!! Confirmation emails are sent immediately. If you don't see one check your junk-mail folder.